In the majority of Russian regions (cities), the quality of water is appreciably worse with respect to the aforementioned parameters, whereas the UV equipment in use is mostly unable to provide doses of UV irradiation sufficient for the effective inactivation. The acting Russian norms and regulations on the UV flux density (16 20 mJ/cm2) are beneath all criticism . Therefore, the reports of Russian scientists on the state-of-the-art disinfecting technology that combined the simultaneous action of ultraviolet and ultrasound to water under treatment have excited keen interest among the specialists of the leading word companies. On the majority opinion, this technology is actually the break-through in the area of reagent-free water disinfection since under the combined action of ultraviolet and ultrasound, the energy consumption is as low as 5 8 W/m3. The expenses for disinfecting 1 m3 water do mot exceed 0.04 USD (in the USA this figure is 0.07 USD/м3). Ultrasound prevents biofouling of surfaces of protective casings of UV radiators; moreover, ultrasound itself exerts the disinfecting effect. The effectiveness of this method proved during the four-year period of cooperative activities with the scientists of the United African Republic is higher by a factor of several hundreds compared to that of conventional UV systems. The proposed method of Ultraviolet + Ultrasound is most reasonable and economic way of water disinfection in housing (at the inlet to apartment houses), in particular, keeping in mind the growing resistance of pathogenic microflora to the action of UV irradiation (this effect is in fact observed over the last few decades). 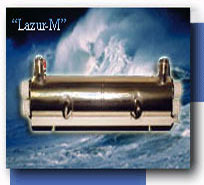 In addition, the prices for our “Lazur”-series units, produced by other Russian companies (NVR, LIT, etc.) are appreciably lower. “Lazur” type units are already operating successfully in a number of residential areas of Moscow, offices, establishments, hotels, bath houses, and swimming pools. Among the end users of “Lazur” units and systems, there are the administrative buildings of the Russian Government and Moscow Patriarchate.